"Red wine and mustard do wonderful things for this tender cut of steak." Whisk together 2 tablespoons of olive oil, 3 cloves minced garlic, parsley, thyme, red wine, 1/2 teaspoon mustard powder, salt, and pepper until combined. Pour into a resealable plastic bag over the flat iron steaks. Squeeze out excess air, seal, and marinate for 1 hour at room temperature, or 4 hours in the refrigerator. Preheat an outdoor grill for medium-high heat and lightly oil grate. Stir together 2 cloves minced garlic, 1/2 teaspoon mustard powder, and 1/2 teaspoon olive oil in a small bowl and set aside. 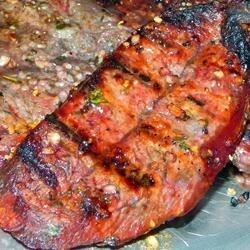 Remove steaks from the marinade, shake off excess, and discard remaining marinade. Cook on preheated grill to desired degree of doneness, about 4 minutes per side for medium-rare. Brush with reserved garlic mixture before serving. This recipe was extremely simple and quick, and the results were delicious. Really good, so tender and tasty.